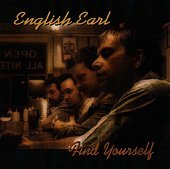 Atlanta, Georgia's four-piece pop-rock act English Earl's sophomore release, Find Yourself, is bland, mediocre pop record that, citing middle-era Beatles as the main influence, tries to hard to make this abundantly apparent. Frontman Earl Bland's vocals are the biggest hit the music takes. Deep and drawn out, they don't have the punch or the harmonious pop beauty of a Lennon or McCartney. But, even though the lush pop vocal arrangements are out of their reach, they still try to grasp onto them and fail miserably. The music isn't half bad. "Soul Mate" finds the band delving into enjoyable pop, while "You Never Smile at Me" mixes in a jazz tingle to the basic pop-rock mix. And "That Cool Song" wins you over with a raunchy bar rocker-gone-pop piece. But, in the end, the vocals destroy the songs and leave them flavorless. I'll give the album a D.